We're at Apple HQ! There's going to be a bit of a wait before we get going, but stick close by! 9:08AM PT -- We've got a little less than an hour to go, so we'll just kind of be loitering outside Apple Town Hall, waiting to spot Steve and the unicorn that is his new MacBook Pro. 9:54AM And we're in our seats! Some nice classical music playing -- just the quiet before the storm we're expecting. 9:57AM "Ladies and gentlemen -- silence your cell phones." 9:59AM People are scurrying to grab their seats. And... Steve's out! 10:00AM "Good morning -- we appreciate you coming down this morning... I think everyone knows today is about notebooks. 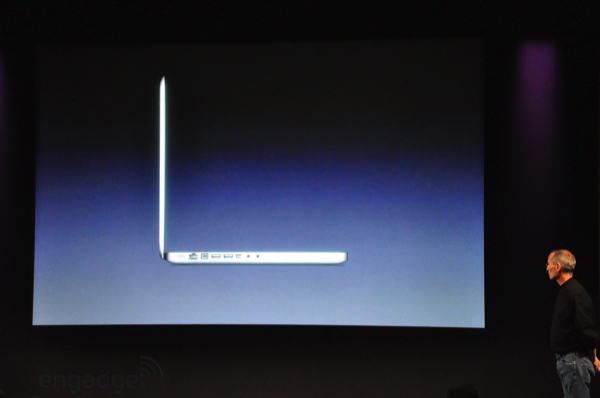 And we've got some exciting new notebooks." 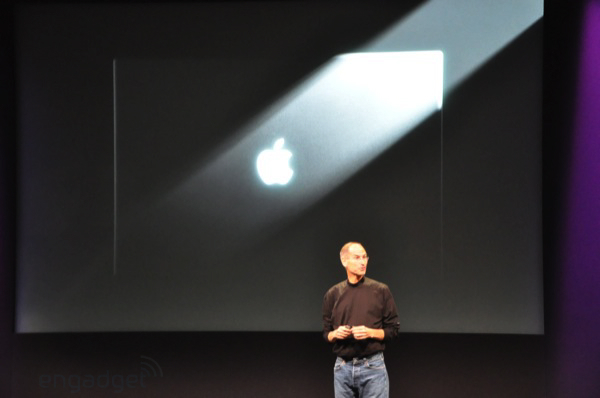 10:00AM "Before that I want to cover the state of the Mac -- Tim Cook will take us through it." 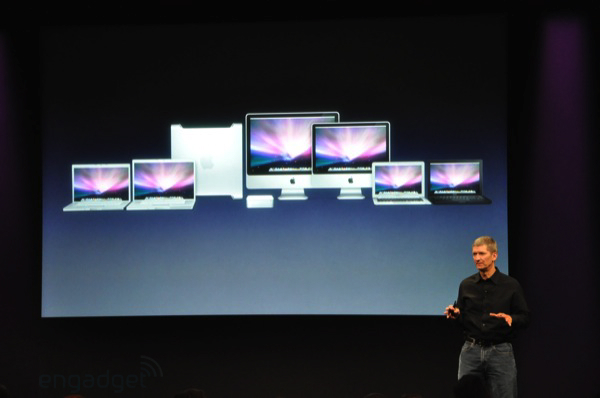 10:01AM Tim Cook: "Good morning -- our last reported quarter we sold 2.5m Macs. In several quarters in a row we've been growing 2/3x the market growth." 10:02AM "Why? Superior computers -- they're far superior to anything on the market." Now he's going through the line, iMacs, Air... "And with those better computers comes better software... like Leopard, like iLife, and products like iWork." 10:03AM "Third reason: compatibility. 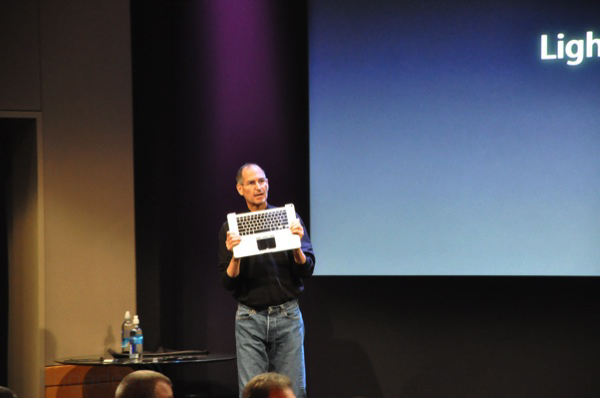 When people looked at macs in the past, they were concerned about switching -- we fixed that with Boot Camp. We also work with third parties on productions like Fusion and Parallels." 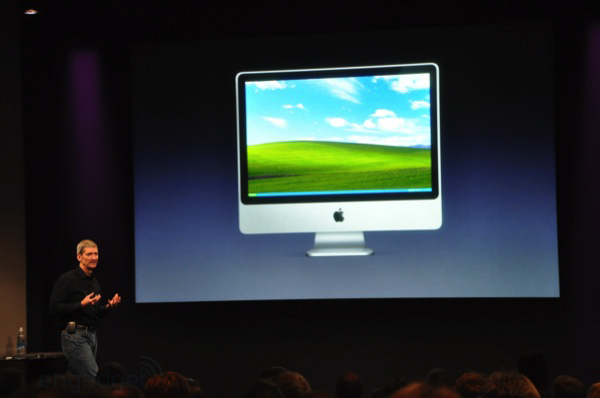 Windows on an iMac. "Frankly this sends a shiver up my spine." Big laughs. 10:04AM Ouch -- "The next up is something we didn't do -- Vista." Big laughs. "I think it's fair to say Vista hasn't lived up to everything Microsoft hoped it would -- and this has given us a door in." 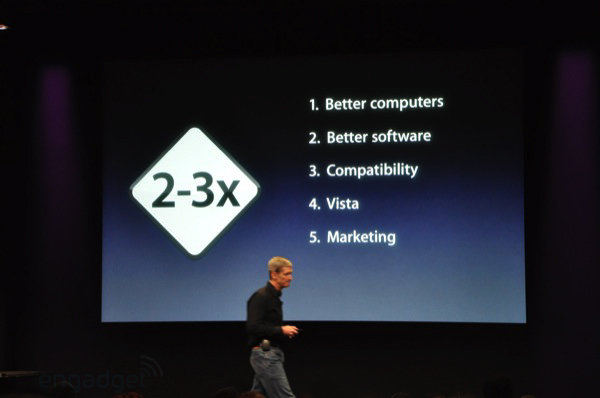 10:04AM Vista -- the 4th reason Macs are doing well. Nasty, nasty burn to Microsoft. 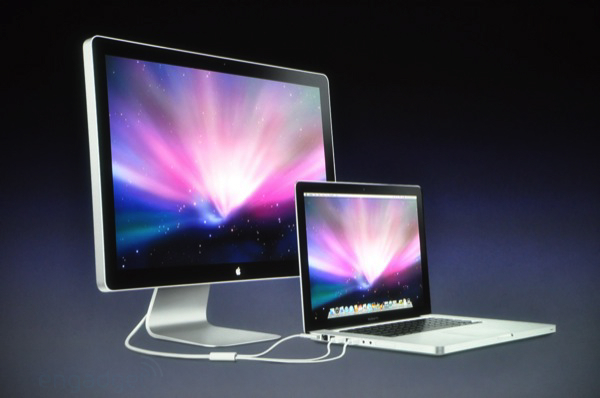 10:05AM Now Tim is talking about the PC vs. Mac ads. Playing one now. 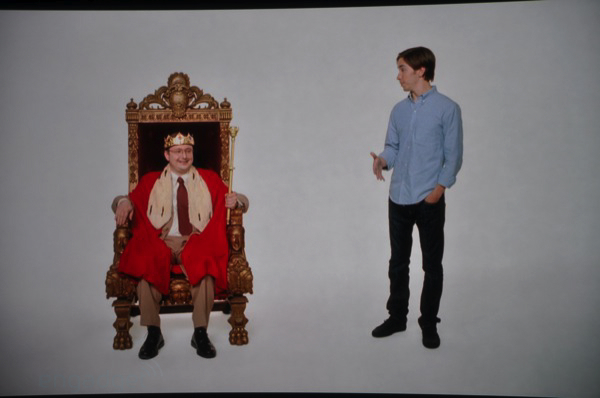 PC is on a king's throne... good stuff. The gist is switching is easy. PC: "I banish you." 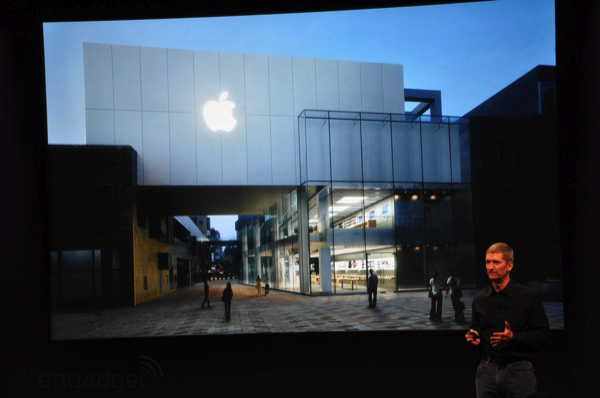 10:06AM Tim: "Retail stores -- 400,000 visitors a day. 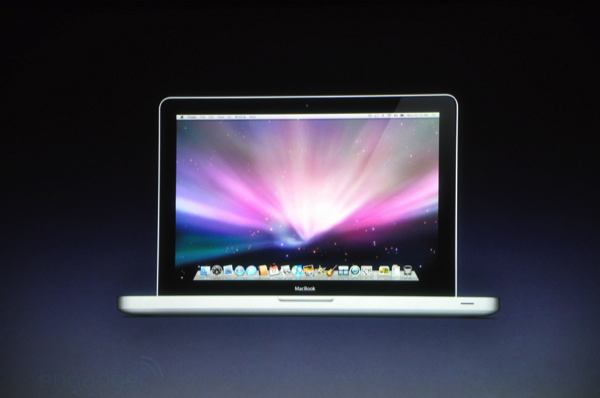 50% of the Macs they sell are people that are new to Mac." Now he's busting out a slideshow of new stores around the world: Sydney, Beijing... "Both stores are off to a great start." 10:06AM "So these are the six reasons we've been successful." 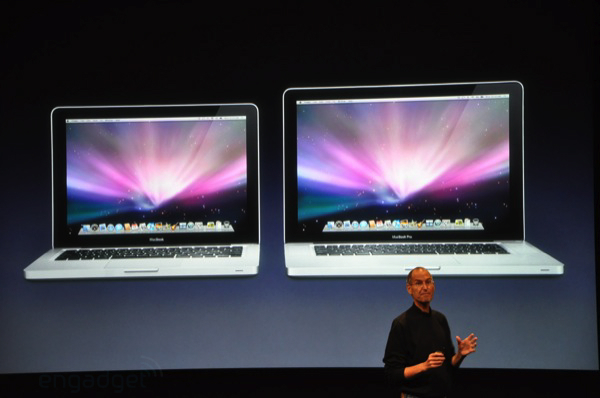 10:07AM "If you look at the history, the Mac has outgrown the market for almost 4 years. 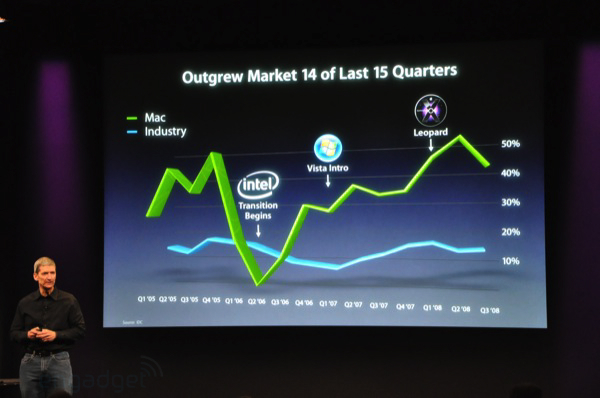 There's been some key milestones along the way, like our transition to Intel, the Vista announcement and Leopard." 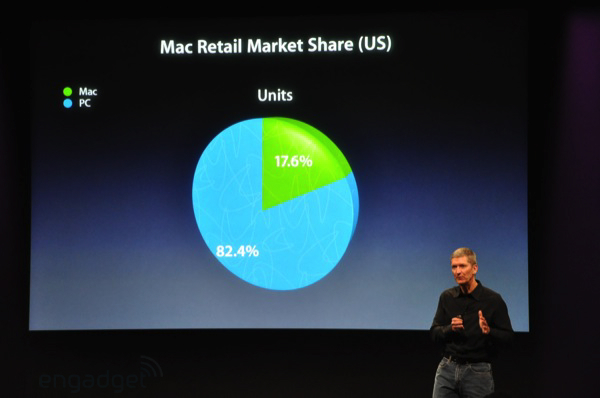 "Since we're growing faster than the market, in US retail market share we've gone from single digits to 17.6%." 10:08AM "One out of every 3 dollars is spent on the Macintosh. What a difference a few years makes." 10:09AM "Macs at major universities -- from 15% to almost 50%" "Many universities requires students have a laptop, we've worked hard to get Mac to be a choice." 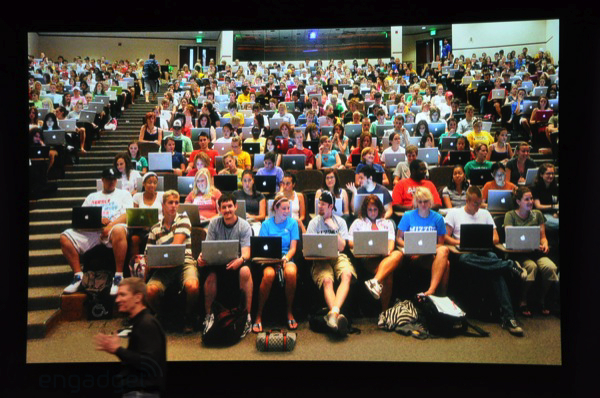 Shot of a school room... every laptop is a Mac! Ha! 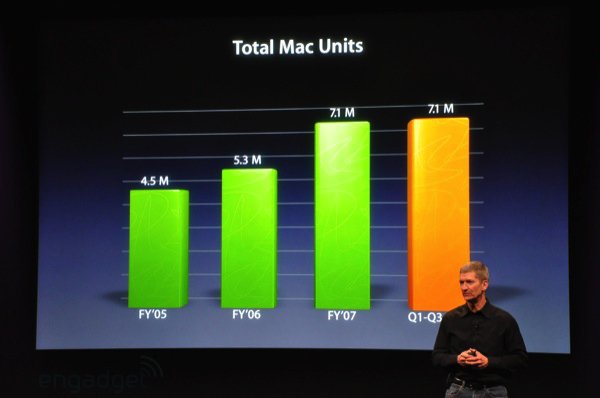 10:10AM "In Q1 to Q3 2008, we've equaled all sales of 2007... that's the state of the Mac!" Steve's back out! 10:11AM "Let's talk about notebooks. Before we get into the actual notebooks, we want to talk about discoveries we've made. 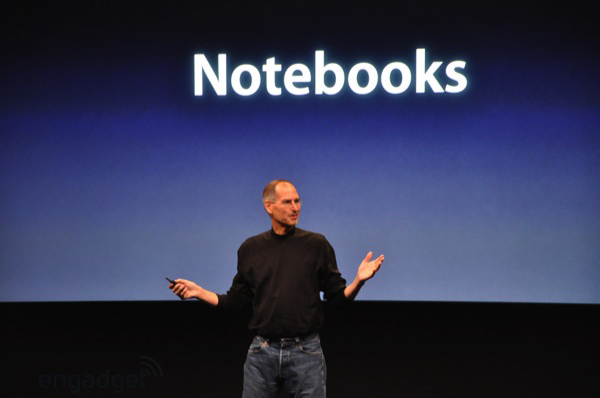 I'd like to talk about some new ways to build notebooks." 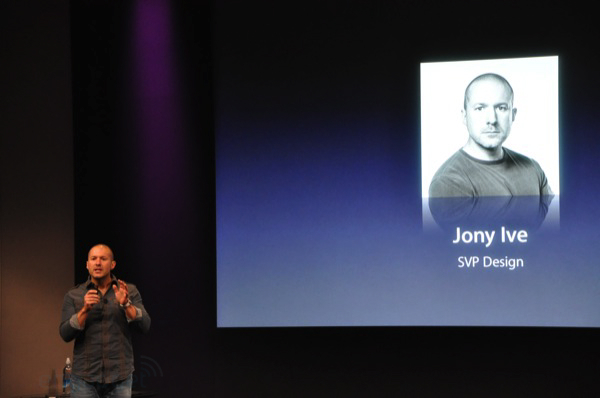 Jony Ive is out! 10:11AM "I'd like to take a couple of moments to tell you about a real breakthrough we've had about how we can design and build our notebooks." "I'd like to start by giving you a sense of context." 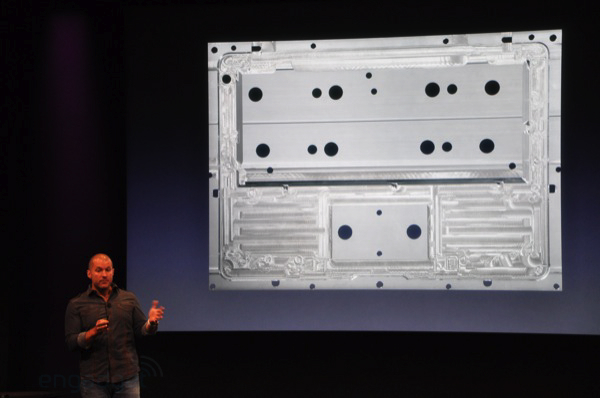 "I'd like to show you how we build our current MacBook Pro." 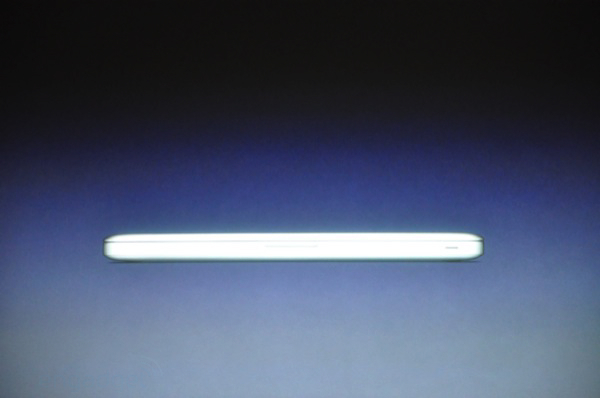 10:12AM "One of the problems is designing something as thin and light as the Pro, but making it strong." 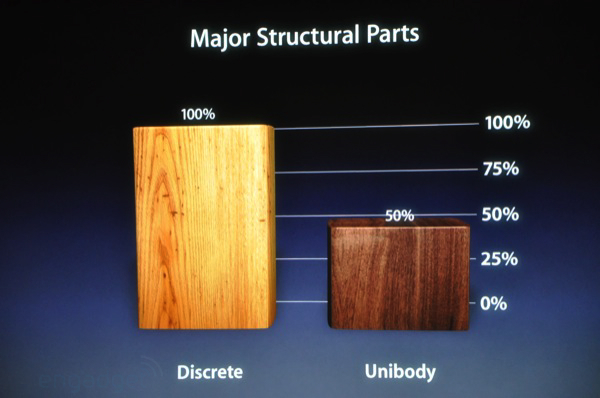 "The structure is primarily derived from this..." Shows the internal frame. 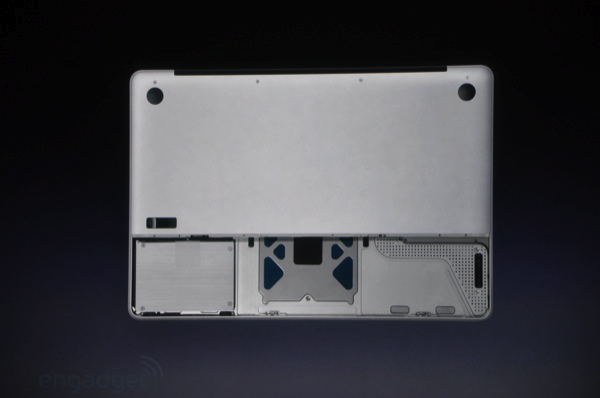 "It's made of multiple parts, then assembled into the bottom case... a very thin aluminum pressing." 10:13AM "The palm rest requires the same sort of internal structure. 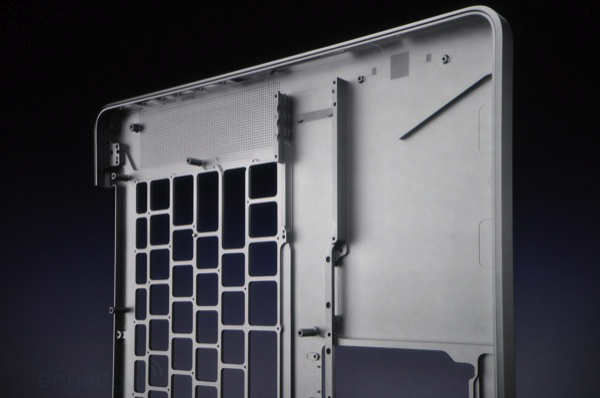 A series of stiffening plates..." "Finally, we had this plastic gasket -- it helps us control the junction." 10:14AM Very dry stuff... he's building here: "We've been looking for a better way -- and we think we've found it." 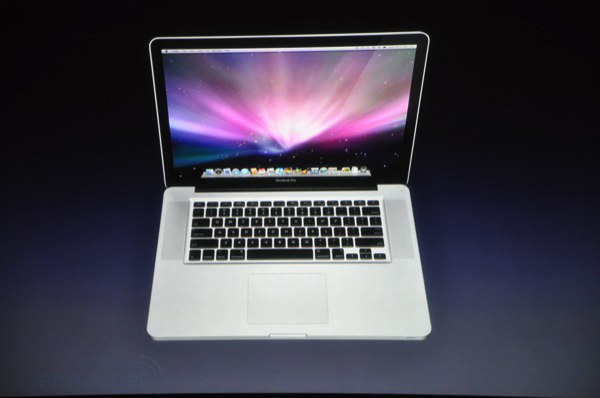 10:14AM "This new process culminated in the design of this product: the MacBook Air. 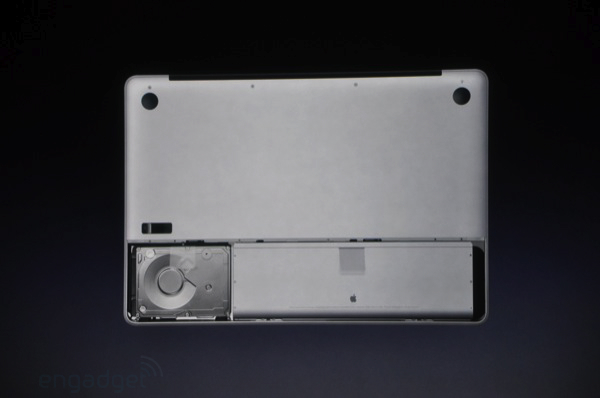 You couldn't build something this strong and thin in the older way." 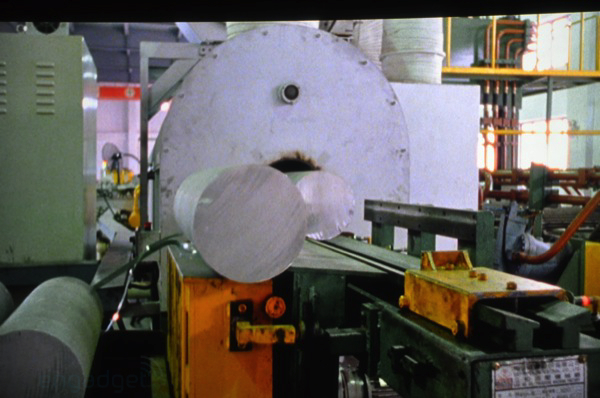 10:15AM "We discovered if we started with a thick piece of aluminum we could make a lighter and stronger part." "So we make it from a solid piece of aluminum." Uh huh... Brickish. 10:16AM He's going through the very detailed way this piece of metal is machined. "We go through a noisy stage called rough cutting -- we create the holes for the key caps, towards the end we anodize it..."
10:16AM "Through each stage we're cleaning, collecting, and recycling the material. We started with a 2.5lbs piece of metal and end up with a piece that weighs a quarter of a pound." 10:17AM "So this new way has a relevance beyond the Air -- we've been working super hard on designing new uni-body enclosures. Thank you." And Steve is back! 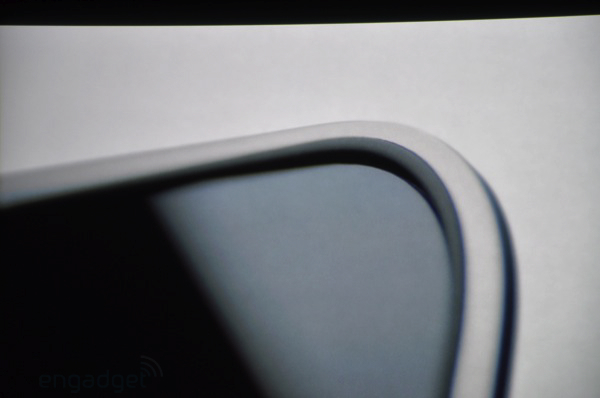 10:18AM "We also have some new graphics for notebooks... NVIDIA talked to us about an amazing graphics part they wanted to use." "We said this is fantastic, but can we use it in a notebook?" 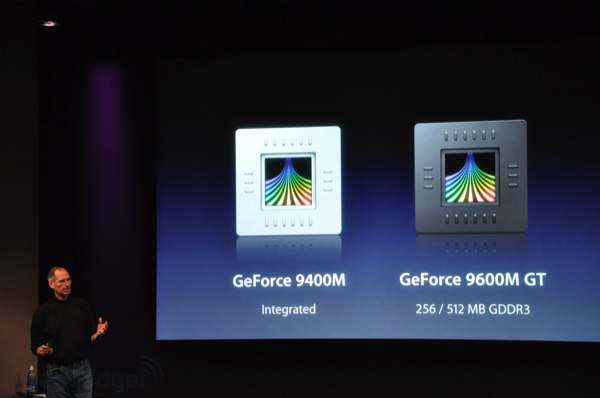 10:18AM "They've dubbed it the NVIDIA GeForce 9400 M -- it's an amazing chip. 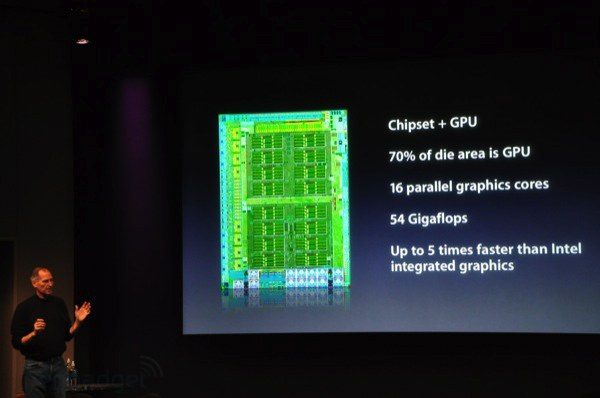 Chipset and GPU on one die -- 70% is the GPU, 16 parallel graphic cores, 54gflops of graphics performance. It's a stunner." 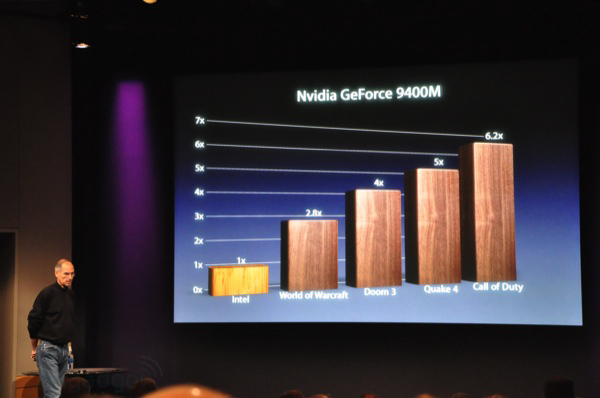 10:19AM "This delivers up to 5x faster graphics than the chips we've been using. So what's it look like when we take it into the real world? 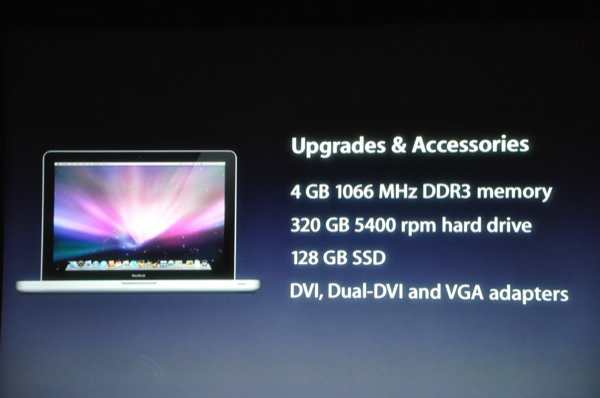 up to 6x performance." 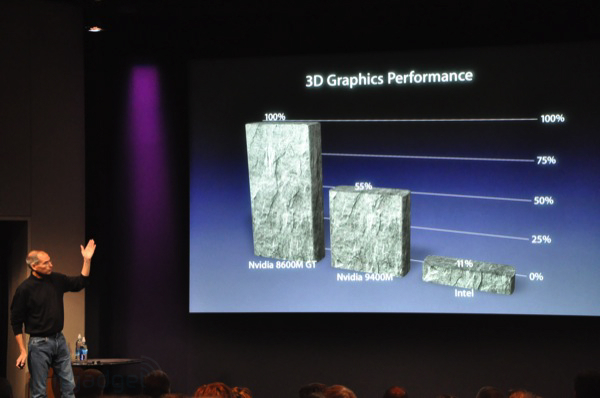 10:20AM "We've been shipping the 8600M, we're at 55% for heavy graphics performance compared to that chip." "We've got some great new graphics." 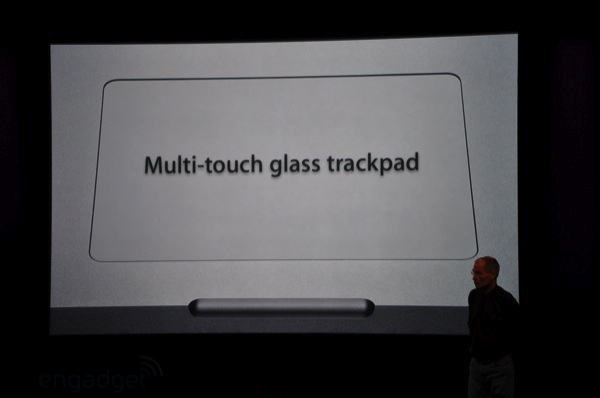 10:20AM "We've got a new trackpad -- a large multi-touch glass trackpad." 10:21AM "39% larger tracking area, multi-touch, glass -- and we've optimized the friction on the glass... but where's the button? It's the entire pad -- gives you more area, keeps you from hunting... multi buttons via software, just turn on in preferences." 10:22AM New gestures... Steve is showing off one and two finger gestures... now three... uh huh, where could this be going? 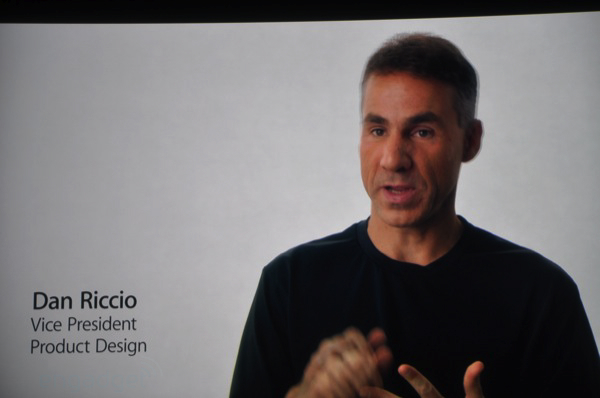 "And we've added some four finger gestures. 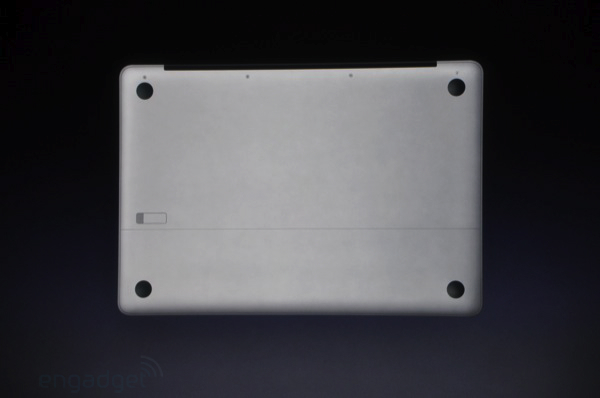 "A new way to open expose, and a great way to app switch..."
10:22AM "So a new trackpad for notebooks. So let's take this tech and make some new notebooks. 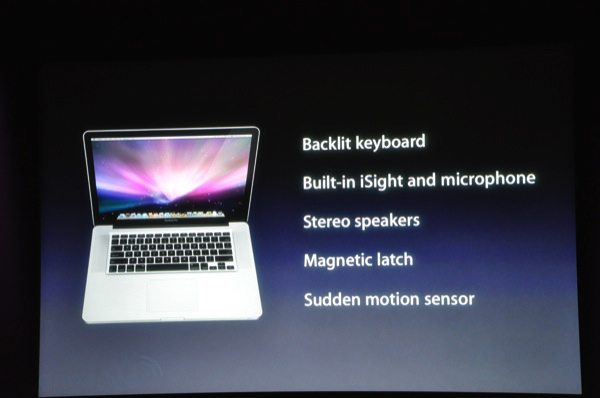 We're introducing the new MacBook Pro." 10:23AM "Today we're replacing the old model with this..." Well, it's EXACTLY like the leak we saw last night. 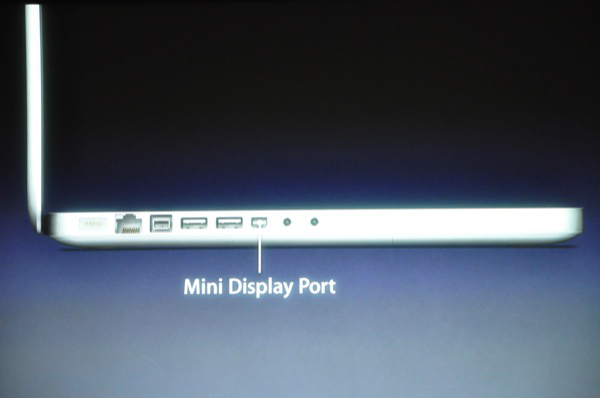 "Glass display, all connectors on one side..."
10:25AM "Mini display port connector... let's take a look at each of these ports. We're not going to talk about the old stuff we've built in, magnetic latch, backlit keyboard, built in iSight... we don't have time to talk about that." 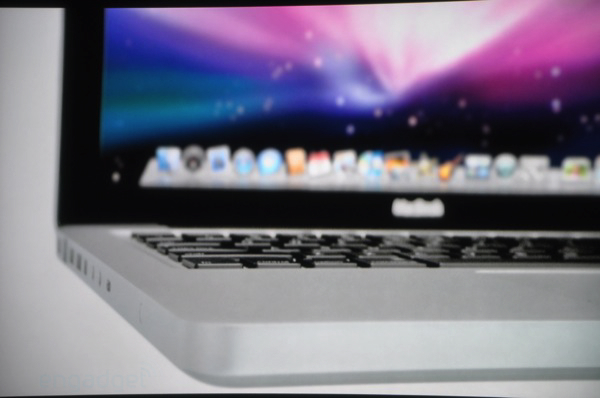 "Precision unibody enclosure... exceptionally beautiful... much more rigid construction. We're really happy about this." Wow, Steve is going to pass around the shell to everyone. That's kind of awesome. "We need them back." Big laughs. 10:25AM The casing is moving quickly... should be here any second. 10:27AM We got a shot in hand... nice. 10:27AM Well it is incredibly light and thin. Really quite impressive. 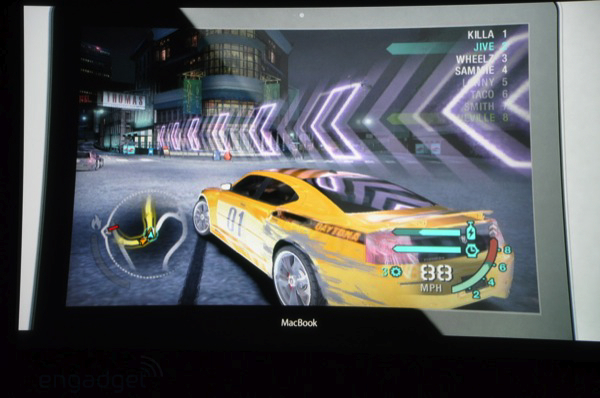 10:29AM "We've added a new chip from NVIDIA -- the 9600M GT, 32 graphics cores, we're including both the 9400 as integrated graphics, or choose the 9600M for big graphic performance. 5 hours of battery life on the 9400, 4 on the 9600." 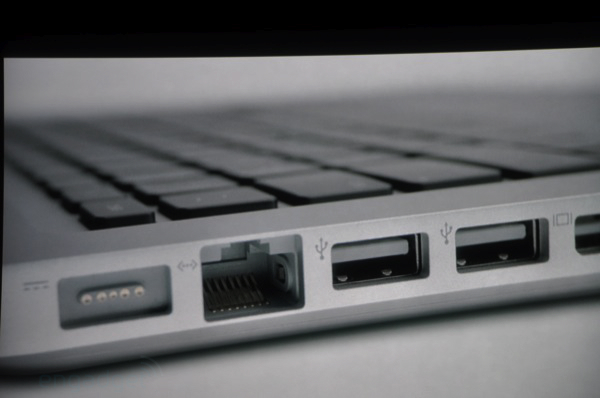 10:30AM "Slot load super drive, MagSafe connector, Ethernet, FireWire 800, dual USB, mini display port, we're going to that on all our products, expresscard 34, and the battery indicator is now on the side." 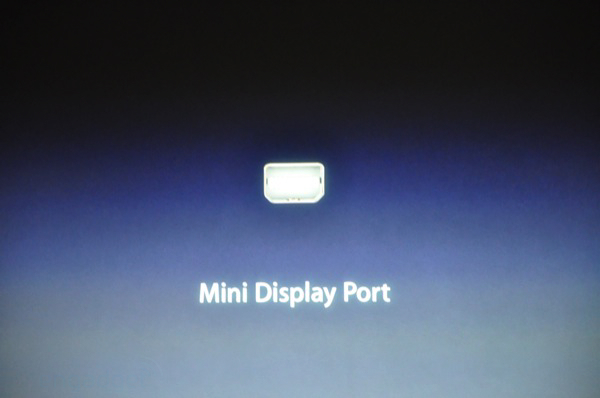 10:30AM "So let's get back to this mini display port -- we can drive any display we could before, but at a fraction of the size -- we're building this into everything we make. 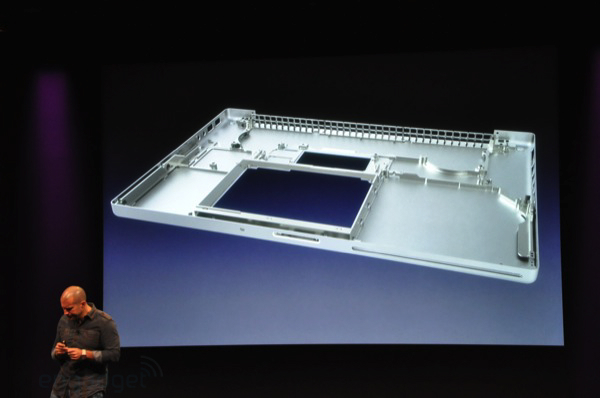 This will also be the first MBP that we offer SSD on, and you can access the drives from underneath the battery." Nice! That's a nice touch. 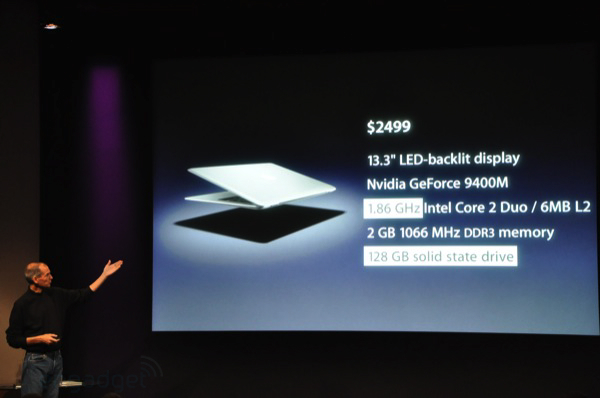 10:32AM "And of course, 802.11n, Bluetooth... .95 inches, our thinnest MBP ever. It's going to come in two models. 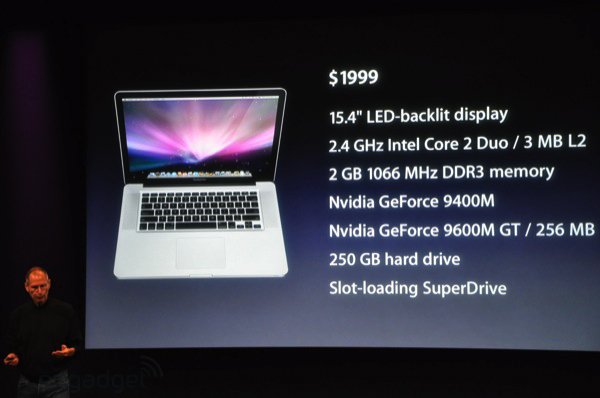 The first, $1999, 15.4 inch display, 2.4GHz Core 2 Duo, 2GB of DDR3 RAM, NVIDIA 9400 and 9600. 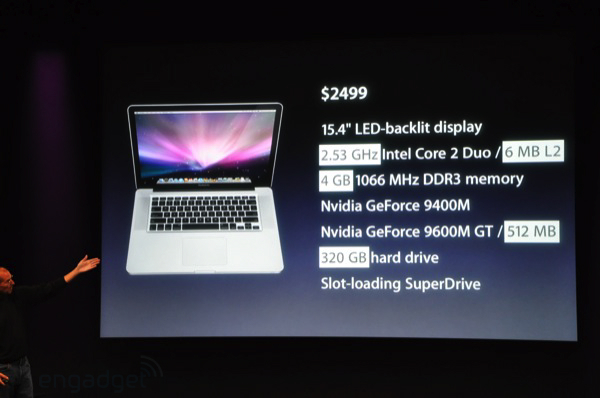 We have a second config at $2499, you get a faster CPU with double cache, 4GB RAM, double graphics memory, 320GB hard drive." 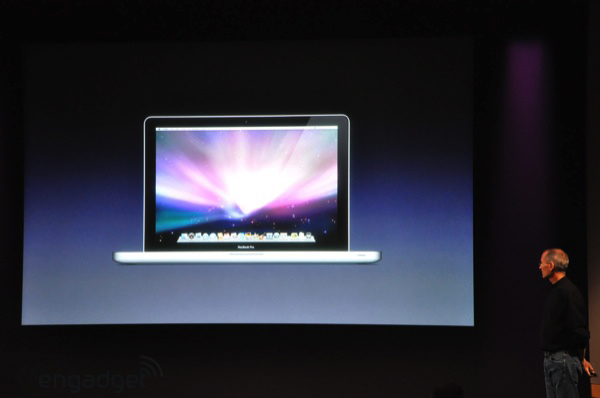 10:32AM "And these MacBook Pros are shipping today, in stores tomorrow." 10:34AM "There's a lot of new tech in these products, but we're proud of the things we left out..." Now he's going to talk about how eco these guys are. "We think we're leading the industry with this... arsenic free glass, BFR free, mercury free, PVC free, 37% smaller packaging." 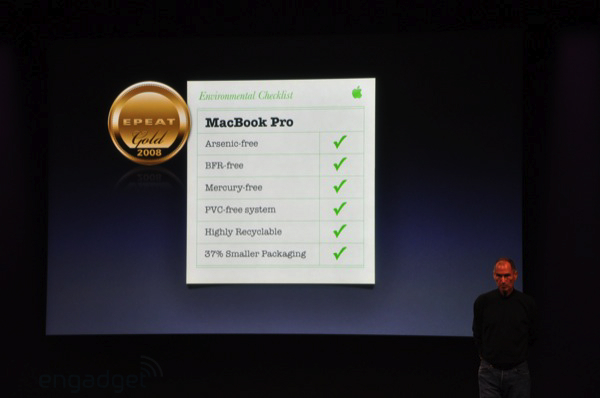 "And for the first time, the MacBook Pro has earned an Epeat gold rating." 10:34AM "Now, we have another cool product we'd like to talk about today. The Air. We'd like to update it with some of these technologies." 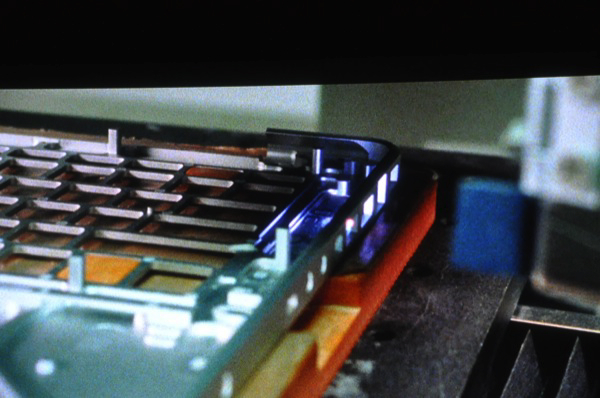 10:35AM "We're putting the 9400M in the Air, adding a 120GB hard drive, and we've got a 128GB SSD as an option -- in addition we're putting in a mini display port." 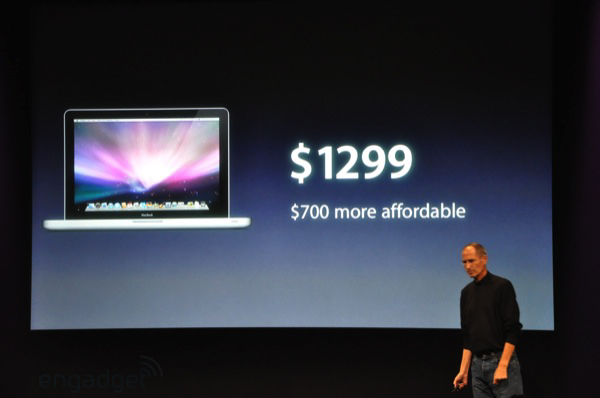 10:35AM "So again at $1799." 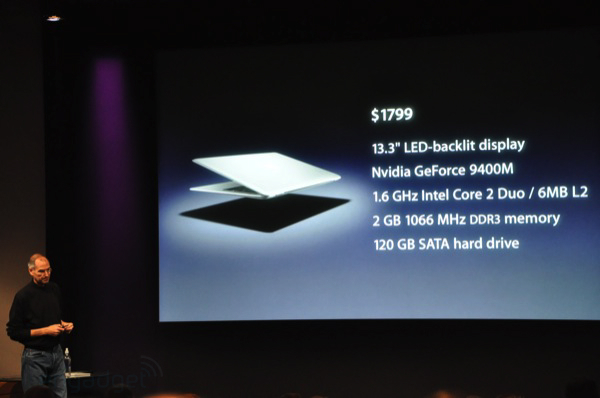 "We have a second model at $2499, gives you a 1.86GHz CPU and SSD -- available in early November." 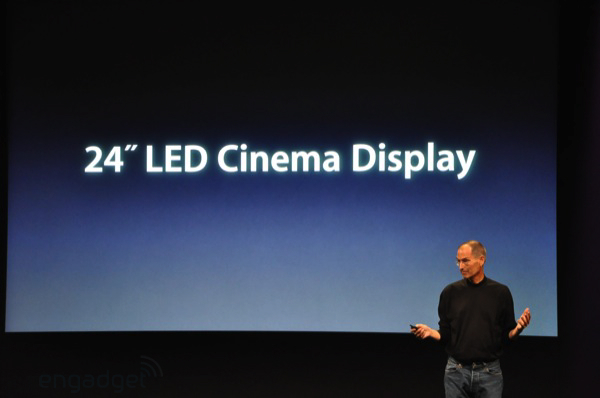 10:36AM "We're introducing a new Cinema Display -- our first with LED backlighting. 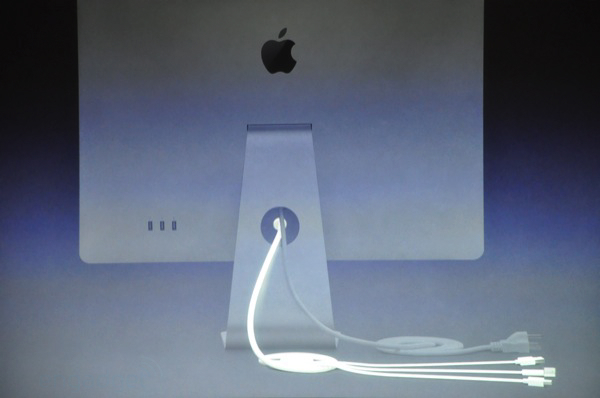 It's got a cable with three connectors: a MagSafe, you can power your notebook, 2nd is a USB port, and third is Display port." 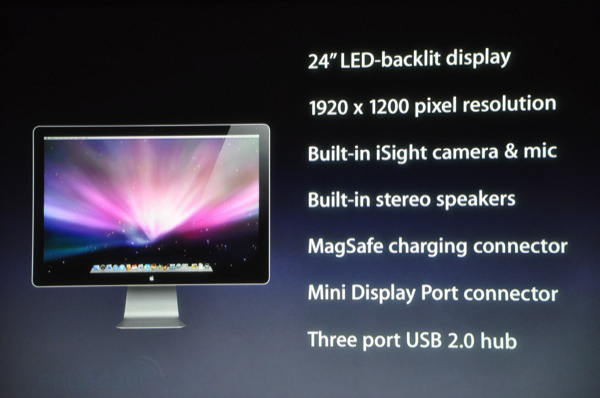 10:37AM "So 24-inch LED backlit display, 1920 x 1200 resolution, stereo speakers... everything you need for $899, available in November." 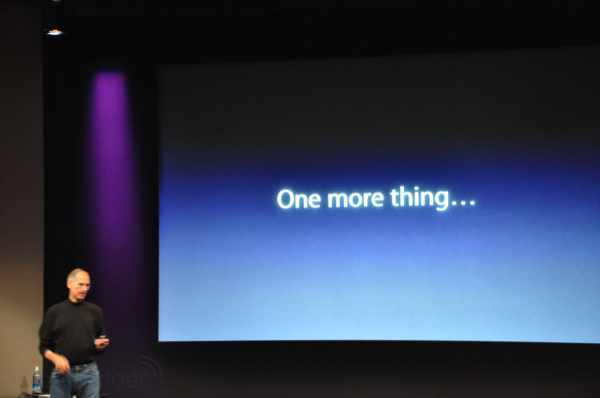 10:37AM "Of course that one more thing is the MacBook." 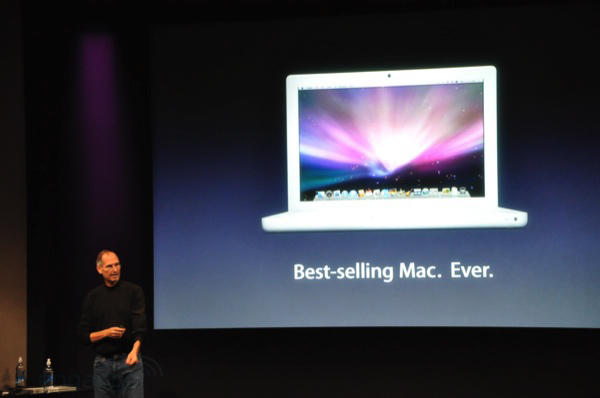 10:38AM "It is the best-selling Mac... ever. We sell a ton of these, and people love them. 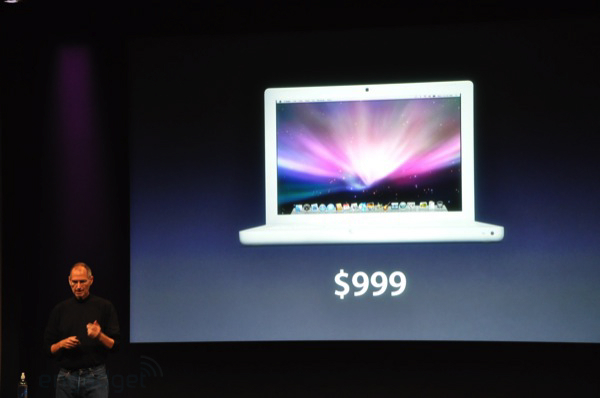 They sell for $1099, and we're gonna keep right on selling these, but we're going to reduce the entry price to $999." Ooh, so close Steve, but not low enough! 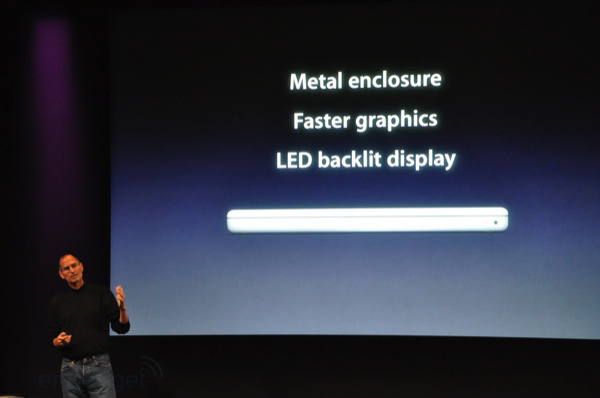 10:39AM "But we've heard that people want a metal enclosure, faster graphics, and a lot of them want LED backlit displays... so, we figured out a way to bring these to the MacBook line." 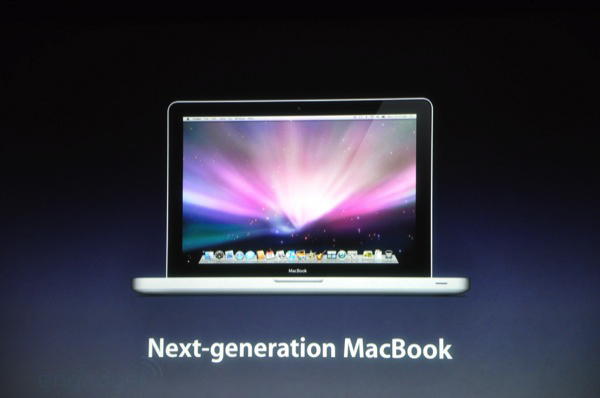 10:39AM "We're introducing a new generation of MacBook on top of the white plastic model." It's just like the Pro... yet smaller. 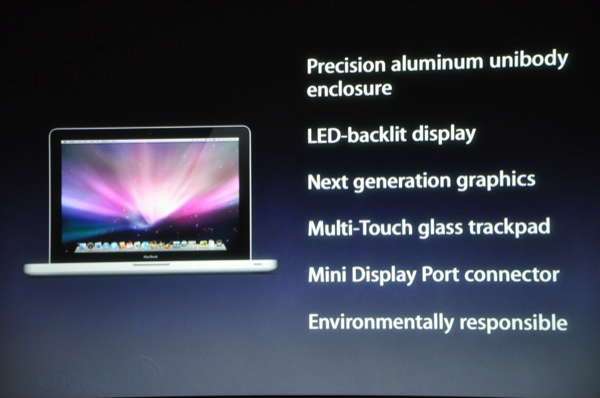 10:40AM It has the same casing, LED backlit display, glass trackpad... the whole nine. Just smaller. Looks like those leaks we saw were right on this too. 10:41AM "Again we're using the 9400M. Here's our system architecture, very clean. 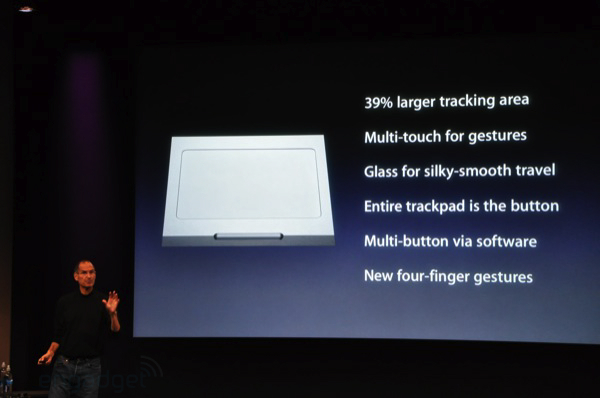 And of course, we've got that glass trackpad, and we've got 5 hours of battery life." Now he's back on the environmental soundness of this thing. 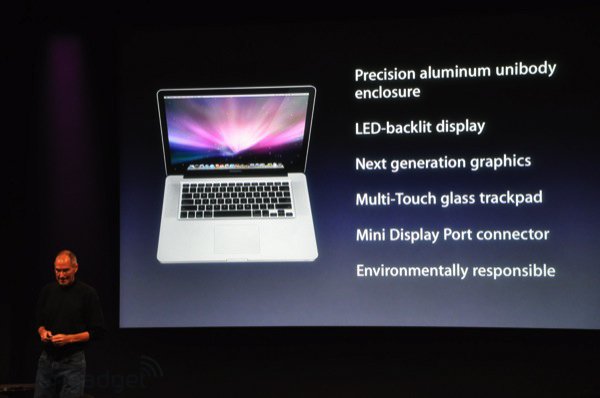 This is the most eco friendly MacBook ever in the history of human existence. 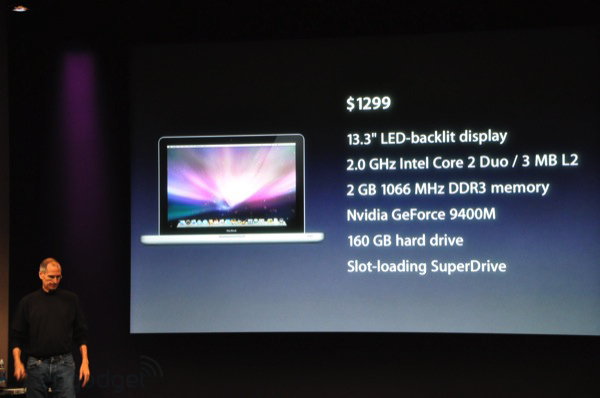 10:42AM "It's going to come in two models -- $1299 for the new MacBook 13.3-inch display, 2GHz Core 2 Duo... that's $700 more affordable for these Pro features." 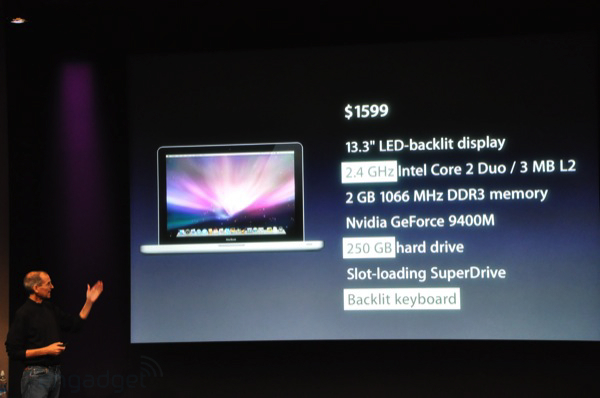 10:43AM "Second model, $1599, 4GB RAM, 320GB HD... and a backlit keyboard. Shipping today, should hit stores tomorrow." 10:44AM "So we think this will be a huge success. So two new notebook families, we're building both in a whole new way, from a slab of aluminum..." So the Brick rumors were just the Air process applied to these new MacBooks / MacBook Pros. Makes a lot of sense. 10:45AM "I've got a video." Ive talking about the construction. 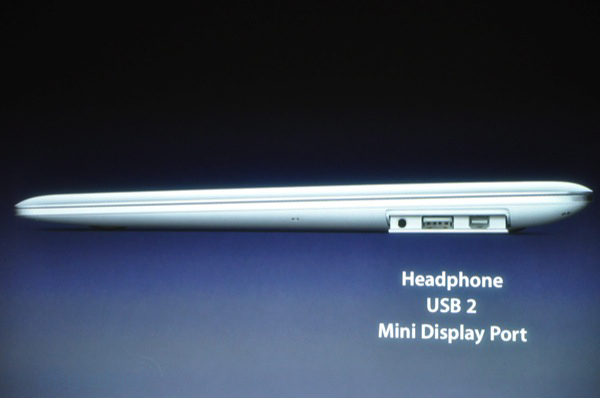 "The new MacBook is remarkable..." Very earnest stuff. Now we're hearing his description of the process again -- seems a little redundant. They're clearly very psyched on bringing this new technique to the whole line. 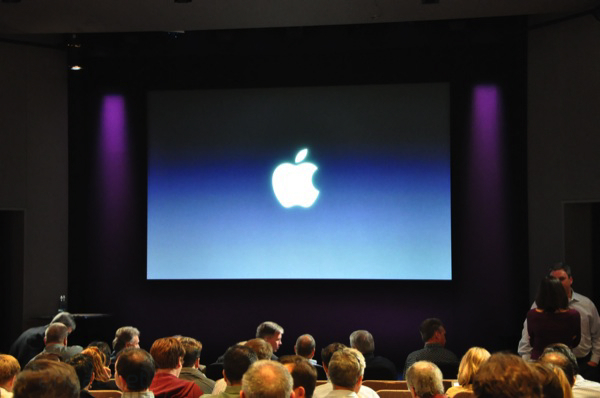 10:47AM We're basically watching a short documentary on how totally awesome Apple's production process is. It's pretty fascinating stuff actually. Turns out machining away a solid block of aluminum isn't wasteful... quite the opposite! 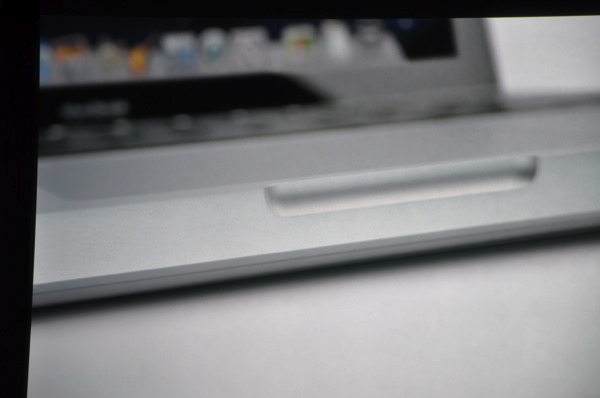 10:48AM Oooh, some nice close-up shots of the new MacBook Pro. 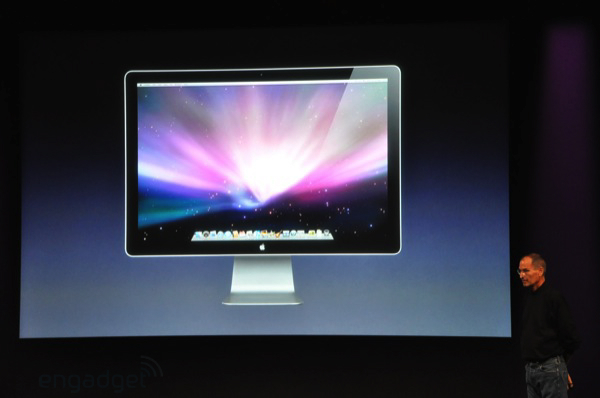 Here's what we're bummed about -- no matte finish for the display? You know, we use these outdoors, this is going to make it kind of a pain. 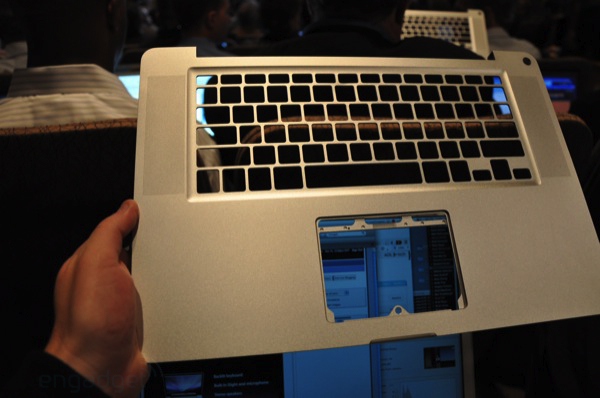 Apple, consider an alternate version. 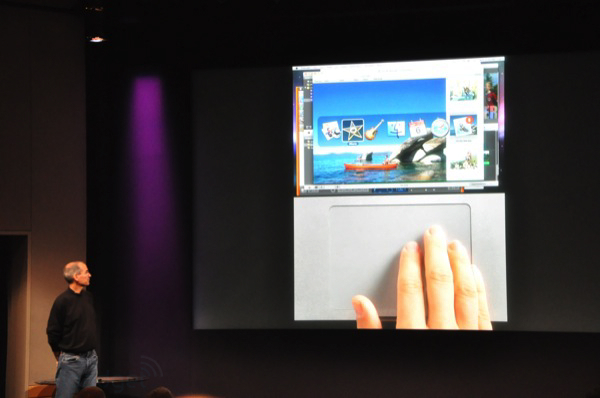 10:51AM Some video of someone using the new trackpad. This looks like it's going to take a lot of getting used to. 10:53AM And Steve is back. "This will be on the web today. So what we'd like to do is have a Q & A session. 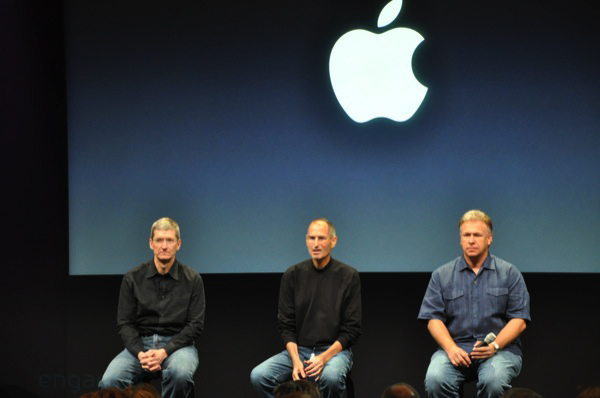 I'm going to ask Phil Schiller and Tim Cook to come up. A few caveats, we can't answer questions about the quarter ending, and secondly... 110/70... this is Steve's blood pressure." HUGE laughs and applause. 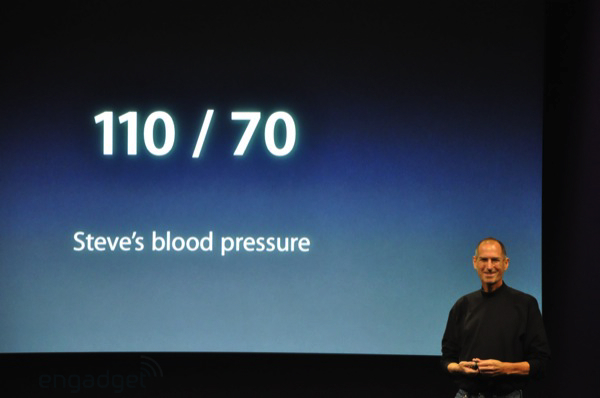 "This is all we're going to talk about Steve's health today." 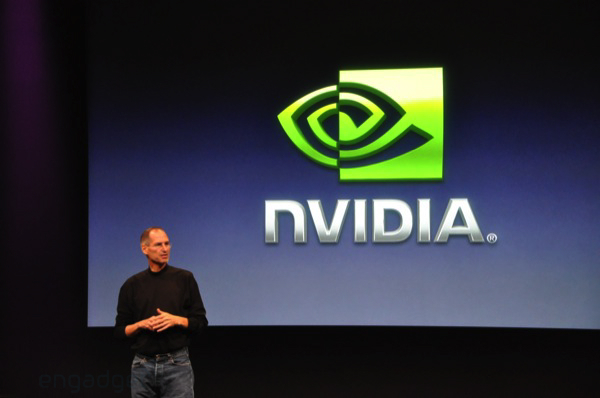 10:54AM Q: Do you have first dibs on this NVIDIA chip? A: Steve: We're the first taking it to market, but it's up to them. 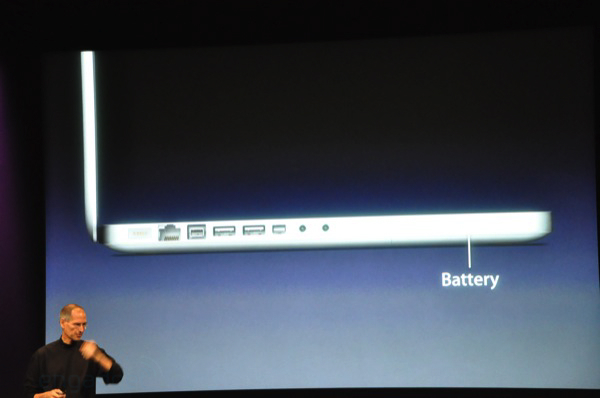 10:55AM Q: No Blu-ray, and display port -- why no HDMI? 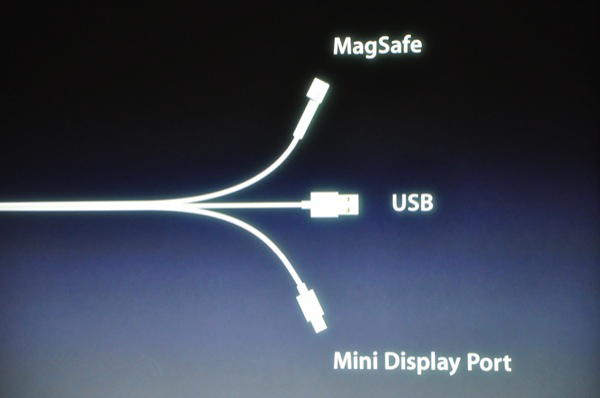 A: Steve: HDMI is limited in resolution. 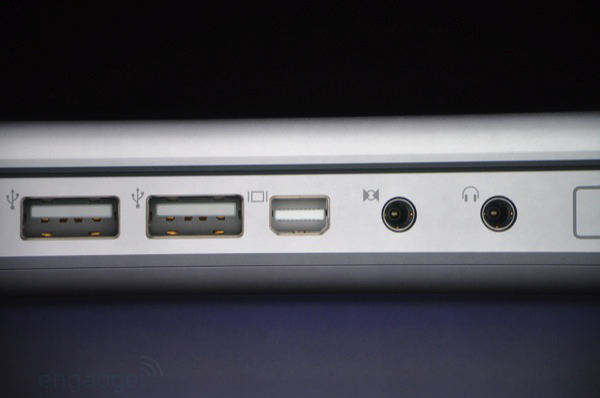 Phil: for typical computer use, display port is the connector of the future. Steve: "Blu-ray is just a bag of hurt. It's great to watch the movies, but the licensing of the tech is so complex, we're waiting till things settle down and Blu-ray takes off in the marketplace." 10:56AM Phil: "We have the best HD movie and TV options in iTunes." 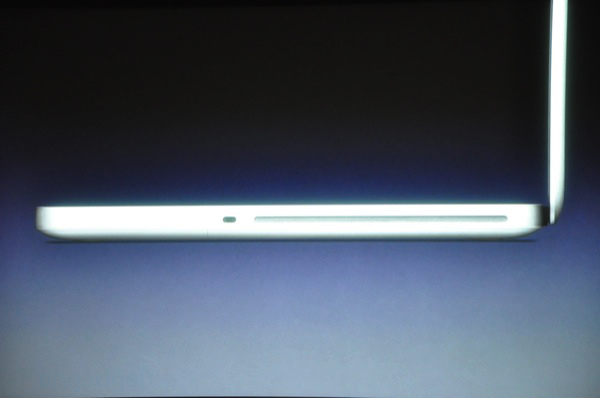 10:57AM Q: What's up with the 17-inch? A: Tim: It's being refreshed today as well. 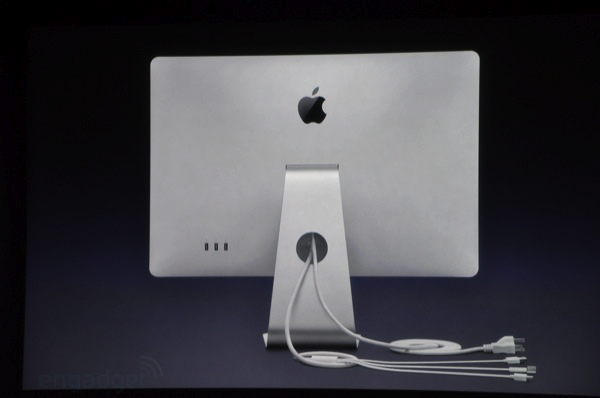 11:01AM Q: Concern about the glossy screens. Are you going to offer another option? 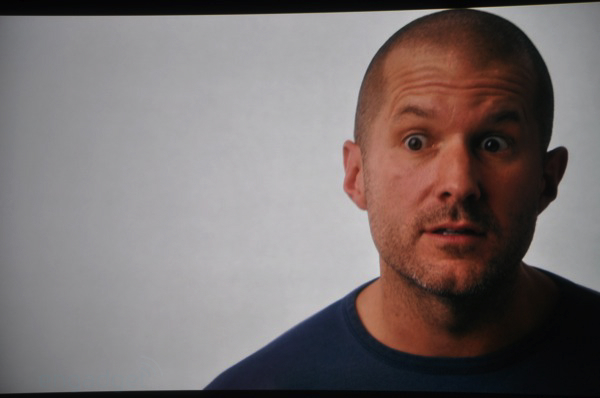 A: Steve: We're going all glass -- we won't offer another version. 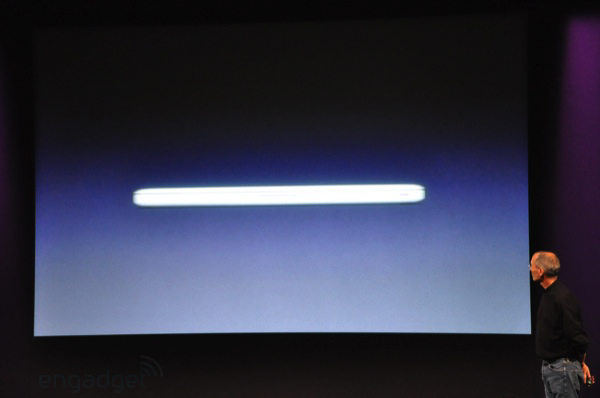 Phil: You offset the reflection by the brightness, and consumers love it. One of the great things about a notebook is you can turn it however you want! Yeah, nice try, but that's kind of a pain. 11:02AM Q: Are we going to see a netbook? 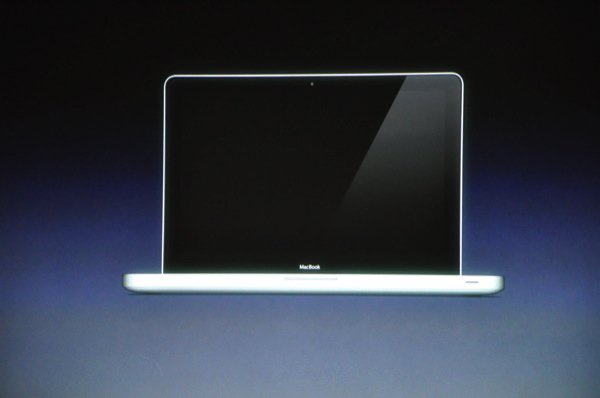 A: Steve: In terms of netbooks, that's a nascent market that's just getting started. 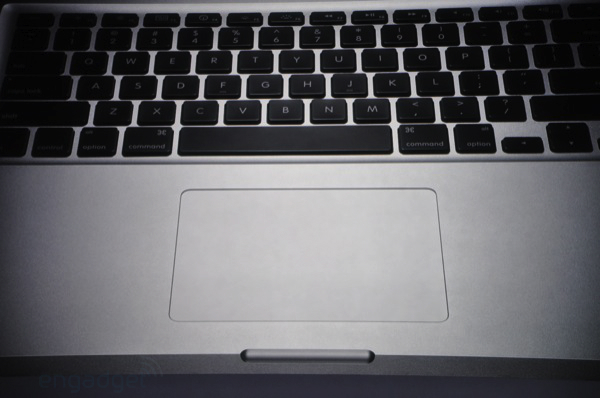 11:03AM Q: You've put a lot of work into the new touchpad, do touchscreens not make sense? A: Steve: so far it hasn't made a lot of sense to us. 11:03AM And that's all! Time for some hands on!